Carson was up at 5 and ready to get everyone else up. I told him he had to wait a little longer. Emma and Parker have bad colds and they needed a little more sleep. Eventually all 3 boys were up in our room begging to get Emma up. At 6 we said ok. 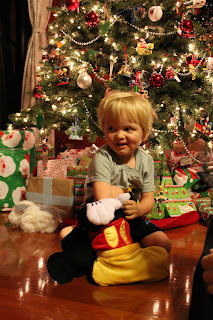 The first thing Parker told everyone was, "Guess what guys, I saw Santa last night. I slept on the couch and I saw him eat the cookies." 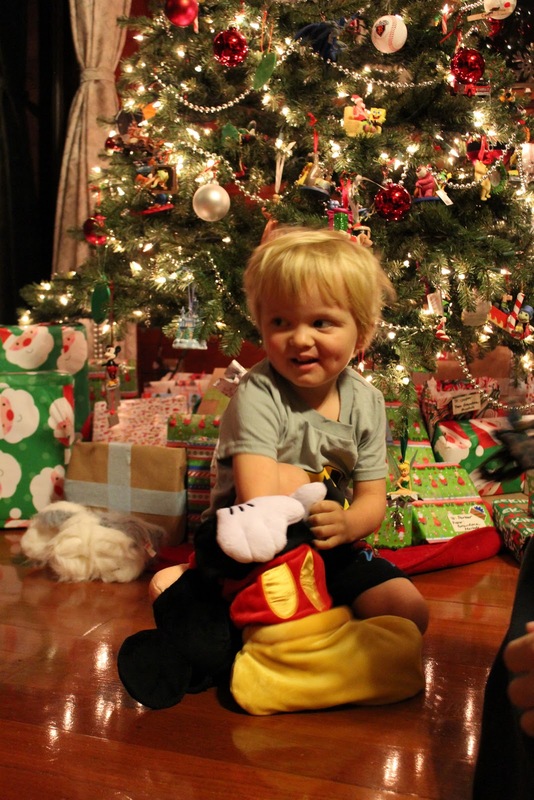 He was so excited to tell us and he truly believes he saw Santa. 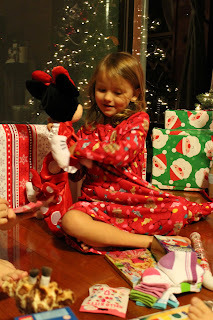 Those are the memories that make Christmas so special. They all grabbed their blankets and babies and headed out to the living room. First they had to check and see how much Santa ate. Oh my, Santa was hungry. He ate almost all the cookies. I bet Santa had a tummy ache last night (he did). Then we they ran over to see what Santa had left them. They were so excited. We opened stockings youngest to oldest. Parker got cars squinkies, socks, paints, hot wheels, snowmobile Batman, a new stuffed Nelson dog and some candy. Emma got bracelets, socks, hello kitty mini figs, a movie, a new hello kitty baby, candy, and paints. 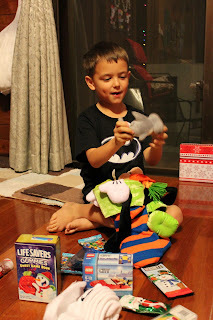 Cooper got a new hammerhead shark, 2 mini lego sets, 8 lego mini figs, socks, paints, and candy. 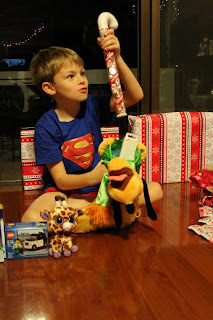 Carson got a new giraffe with purple feet, 2 mini lego sets, 8 lego mini figs, socks, candy, and paints. 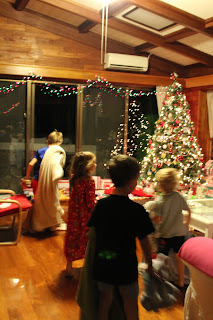 After stockings they opened the presents from Santa. They were so excited that they wouldn't hold still, so the pictures were blurry. Parker got a new treasure island thomas train set, Emma got the Barbie vacation house, Cooper got the Lego fishing boat he has wanted forever, and Carson got the Toys R Us Lego truck. 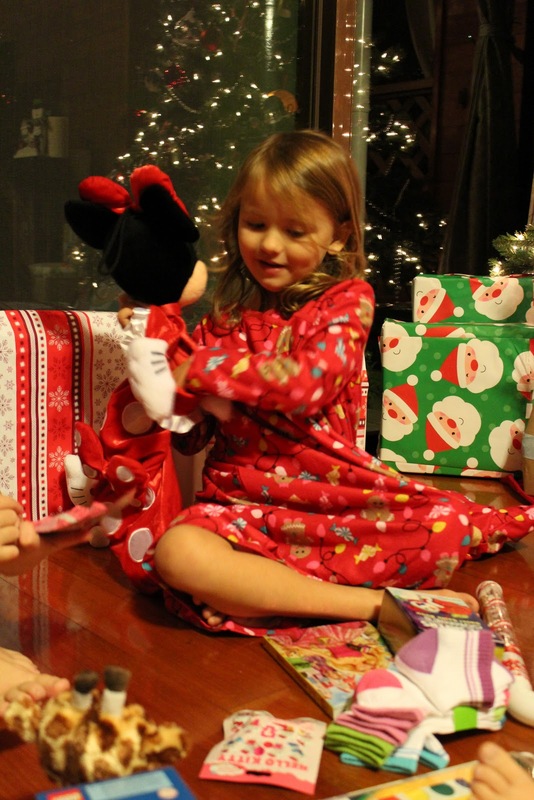 They were so excited with their presents. They started playing while we made breakfast.